The most famous protest against the war in 1917 was Siegfried Sassoon’s. Much less well-remembered is the sudden and vocal conversion to pacifism of Skimpole, of St Jim’s School, as recorded in the Gem comic. 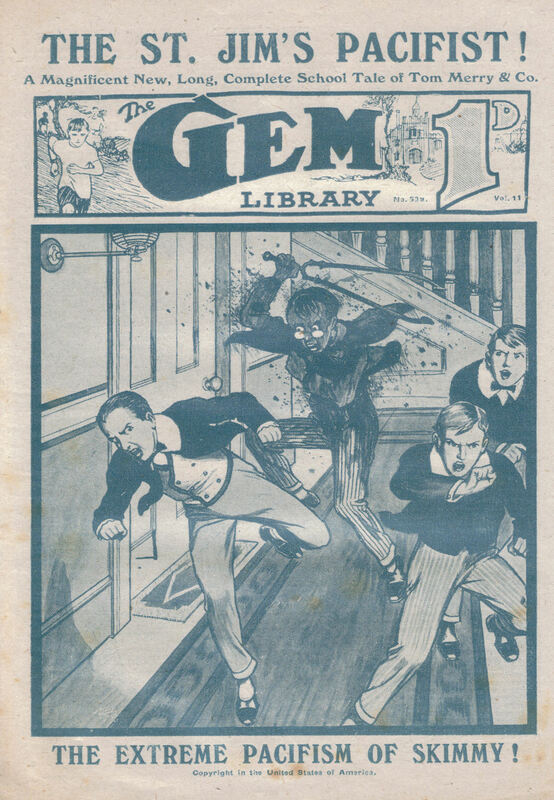 I’m preparing a talk on the treatment of the war in the Magnet comic for a conference in November, so thought I ought to take a closer look at the Magnet’s sister paper, the Gem. By and large, the Gem stories are less interesting. Though the extraordinary Charles Hamilton wrote most of the long stories in both weekly magazines (as Martin Clifford in the Gem, and as Frank Richards in the Magnet) he put more of his talent into the Magnet, I think. Yet the Gem does make strong points about several wartime issues. There is a good story, for instance, about the boastful son of a war profiteer coming to the school. And in November 1917, we get the story of Skimpole the pacifist. Skimpole was dreamy and visionary, he had huge ideas and many of them, but he never reduced any of them to a practicable shape. He was the best-natured and most absent-minded fellow in the School House, and he would carry out his peculiar ideas on the subject of Socialism at any expense to himself or anybody else. He never got half way through an idea without throwing it aside for something new – something just as visionary and impracticable. In ‘The St Jim’s Pacifist’ of November 1917, Skimpole gets a new craze – pacifism, and ‘Martin Clifford’ gets a fair amount of comic mileage out of the situation. Some of the satire is clunkingly obvious (Skimpole reads a pacifist treatise by ‘Professor Balmycrumpet’) and this is one of those stories where beatings of stupid people are presented as unreservedly funny. This does not go down well with Herr Schneider. ‘I am aware, sir, that you are very keen on the war, like so many gentlemen over military age,’ went on Skimpole brightly. ‘But I hope to bring home to your mind sir, that -’ Even Skimpole faltered as he caught the terrific expression on Mr. Selby’s face. This goes down extremely badly, and it is pretty obvious that Skimpole, for all his daftness, is getting close to uncomfortable truths. In the end, a German air-raid convinces Skimpole of the Hunnishness of the Hun, and he immediately goes to the opposite extreme – trying to enlist, although he is only fifteen. He is rejected. It’s a lively enough story, though generally predictable. What I found interesting, though, was that Hamilton wrote this (as Martin Clifford) just a few months before writing a much more nuanced account of pacifism in ‘A Conchy at Greyfriars’ (Magnet, October, 1918). In the later story he presents pacifism as misguided but worthy of respect. What changed his mind? Dissatisfaction with the earlier story? The events of 1918? Some personal experience that made him look at pacifism differently? The more one gets into them, the more interesting Hamilton’s wartime stories become. This entry was written by George Simmers and posted on October 10, 2015 at 12:41 pm and filed under popular culture with tags comics, Frank Richards, Gem, Greyfriars, Martin Clifford, pacifism, ST JIms. Bookmark the permalink. Follow any comments here with the RSS feed for this post. Post a comment or leave a trackback: Trackback URL. In the earlier story, the schoolboy is attempting to stick up for his father by adopting his principles, whilst Skimpole is simply a faddist. He swallows ideas whole and then simply regurgitates the arguments without consideration. At the end he is completely sold on the idea of the War, and again he seems to have simply adopted someone else’s arguments lock, stock and barrel. The boy in the earlier story seems actually to be motivated by love and respect for his father, rather than a deep belief in pacifism. Skimpole is like those celebrities who loudly proclaim their Socialist beliefs but don’t mind taking huge amounts of money for doing voice-overs for TV commercials. It’s possible that Hamilton is really having fun at the expense of the sorts of people who unthinkingly adopt philosophies without thinking them through, rather than attacking pacifism per se. Hamilton was well-read and I think it’s a cinch that Skimpole was named for Dickens’ unworldly character of the same name, given their similarities.